All 3rd, 4th and 5th grade students interested in the American Revolution can participate in the Americanism Elementary School Poster Contest. The contest is open to public school, parochial, home schooled, Scouting, or Children of the American Revolution member students in that same grade range. Young students with enthusiasm toward art, a love of American history, or a desire for creative expression can submit their posters to their local SAR chapter for competition. The maximum poster size is 24” x 36”. 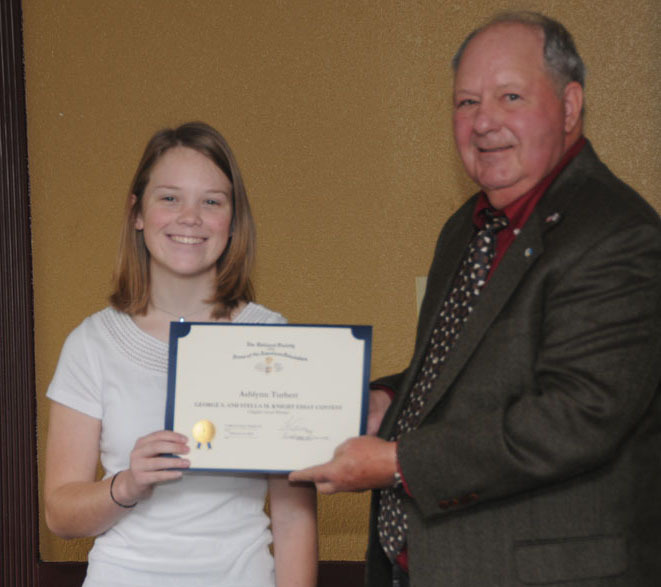 The Americanism Poster Contest begins at the SAR chapter level, however a student’s poster may eventually be judged and earn a cash award at the national level in June at the annual SAR Congress. A complete set of rules, along with the application for both the applicant and the sponsoring SAR members, can be found above. Interested applicants should contact our chapter Education Chairman, Rodney Weems, for further details and application deadlines. All 6th, 7th, 8th and 9th grade students interested in the American Revolution are invited to participate in the Sgt. Moses Adams Memorial Middle School Brochure Contest. The contest is open to public school, parochial, home schooled, Scouting, and Children of the American Revolution member students in that same grade range. The theme for the brochure will be “The Foundational Documents of the United States.” Contest entrants may choose any of the following examples for their brochures, including the Articles of Confederation, the Declaration of Independence, the U.S. Constitution, the Federalist Papers, and the Bill of Rights. A complete set of rules, along with the application for both the applicant and the sponsoring SAR members, can be found above (at the top of the page). Interested applicants should contact our chapter Education Chairman, Rodney Weems, for further details application deadlines and entry into the competition. 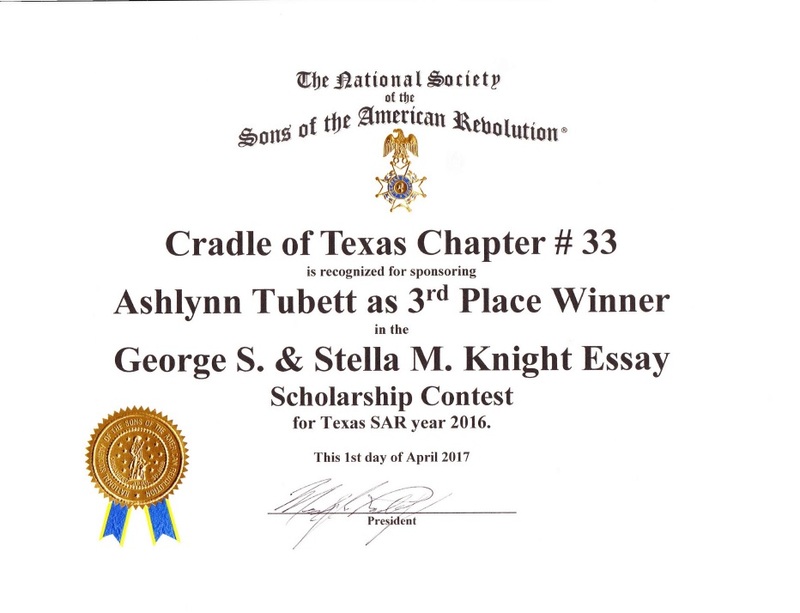 All high school students (9th through 12th grades) interested in the American Revolution are invited to participate in the George S. & Stella M. Knight Essay Contest. The contest is open to all students attending public, parochial, private high schools or home schools in that same grade range. To participate, students must submit an original 800- to 1,200-word essay based on an event, person, philosophy or ideal associated with the American Revolution, Declaration of Independence, or the framing of the United States Constitution. Each student’s essay will be judged based upon its historical accuracy, clarity, organization, grammar and spelling, and documentation. The contest is conducted in three phases: the local chapter, state-level society, and national phases. The contest is usually entered through an SAR chapter near the student’s residence. To learn how to write a winning essay, see the discussion by Dr. Rice, past Texas Society Essay Chairman. For an example of what this competition can mean for you, please see this letter of appreciation. A complete set of rules, along with the application for both the applicant and the sponsoring SAR members, can be found above (at the top of the page). Interested applicants should contact our chapter Education Chairman, Rodney Weems, for further details, application deadlines and entry into the competition. The Children of the American Revolution (C.A.R.) is an organization of persons 21 years of age and younger who are lineal descendants of a patriot of the American Revolution. The C.A.R. is an independent organization that depends on the SAR, DAR and other recognized organizations for its leadership and financial support. The C.A.R. needs adult leaders, financial support and members. SAR, DAR, and C.A.R. members who give their time and effort toward supporting the C.A.R. are candidates to receive the C.A.R. Activity Award. This recognition can be given through the SAR or C.A.R. Medals of Appreciation or other appropriate medals for support and service to the C.A.R. The application for both the applicant and the sponsoring SAR members, can be found above (at the top of the page). One or more of our chapter Officers will initiate this award. 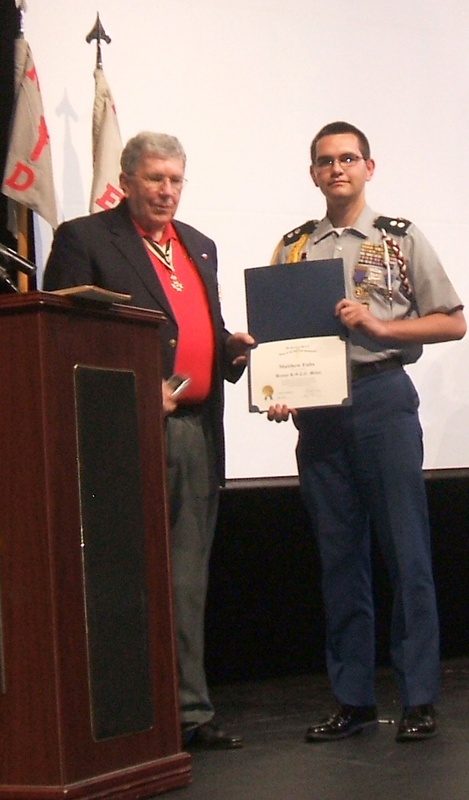 The NSSAR invites all high school students (9th through 12th grades) interested in the American Revolution to participate in the Joseph S. Rumbaugh Historical Oration Contest. The contest is open to all students attending home schools, public, parochial, or private high school students in that same grade range. While the preliminary rounds of the contest begin at the local level, students may eventually advance to the state or national levels, eventually held in June during the annual SAR Congress. The National Association of Secondary School Principals has placed this program on the 2017-18 NASSP List of Approved Contests, Programs, and Activities for Students. Each student’s five- to six-minute speech (and accompanying manuscript) will be judged based upon its composition, delivery, significance, and historical accuracy and relevance. Three cash awards are given: the National First Place Winner receives $5,000; the 2nd Place Runner-up receives $3,000; and the 3rd Place Runner-up receives $2,000 cash prize. Each also receives an Olympic-sized medal. All other finalists (4th through 6th Place runners-up) are awarded $400 and all other national contestants are awarded $200. 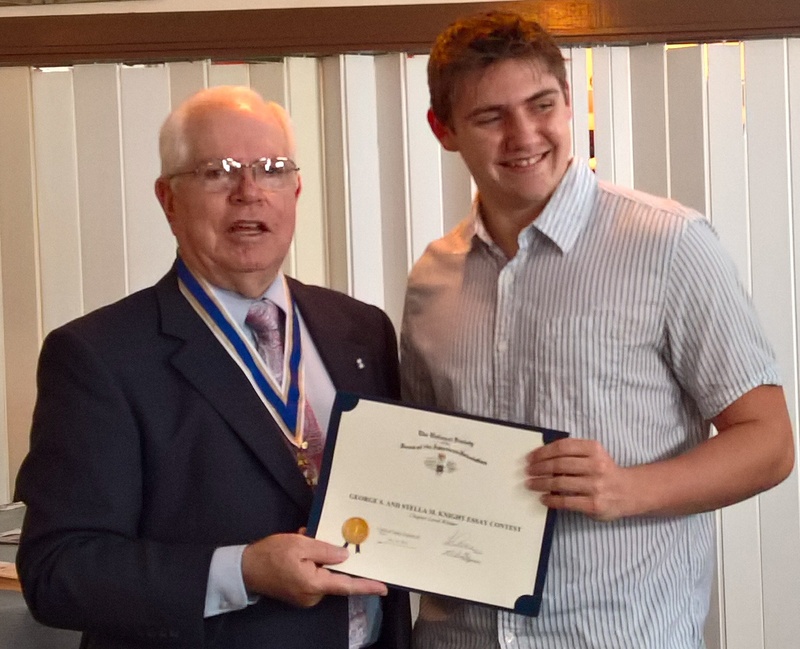 The NSSAR invites all Eagle Scouts (under 19 years of age) interested in the American Revolution to participate in the Arthur M. & Berdena King Eagle Scout Award. The contest is open to all Eagle Scouts who are currently registered in an active unit and have not reached their nineteenth birthday during the year of application. Each Eagle Scout must complete an application form, a four-generation ancestor chart, and a 500-word patriotic themed essay. Contest entrants need complete only one application for the SAR chapter-level competition. The application of the chapter-level winner is forwarded on to the state- and national-level competitions. So, while the preliminary rounds of the contest begin at our Chapter level, Scouts may eventually advance to the state and national levels, where the latter culminates in June during the annual SAR Congress with awards of up to $10,000. Three cash awards are given: the National First Place Winner receives $10,000; the Runner-up receives $6,000; and the 2nd Runner-up receives $4,000. Prizes and recognition may also be awarded at the SAR chapter and state society levels. For instructions for the essay and the 4-generation ancestor chart, click on the link above. A complete set of rules, along with the application for both the applicant and the sponsoring SAR members, can be found above (at the top of the page). Interested applicants should contact our chapter Education Chairman, Rodney Weems, for further details, application deadlines and entry into the competition. 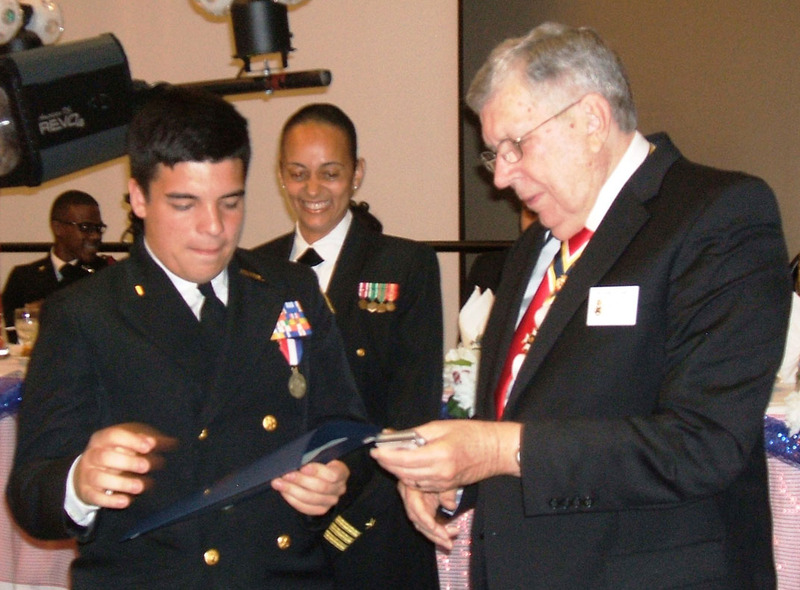 Captain Alden Partridge is considered to be the founder of the Reserve Officer Training Corps (ROTC) program in the United States. Partridge founded the ROTC because his father, Samuel Partridge, a soldier of the American Revolution, was concerned that the young United States lacked the means for developing qualified military officers needed to maintain the principles of our government and protect American freedom. 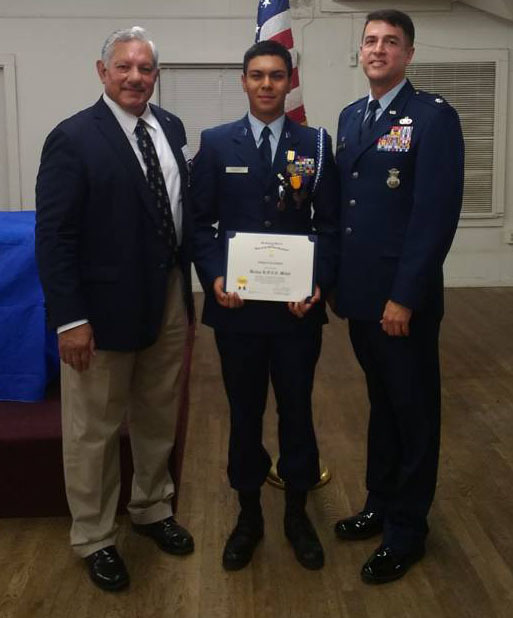 Since these goals closely align with those of the SAR, we strongly support the United States JROTC and ROTC programs. 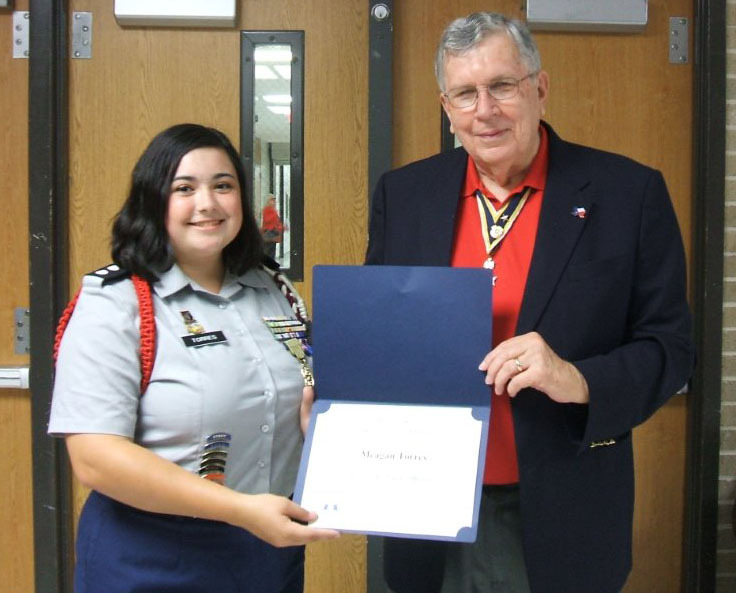 The NSSAR awards the JROTC/ROTC Medal to foster the principle of the “citizen-soldier” exemplified by the Minutemen of Revolutionary War days. 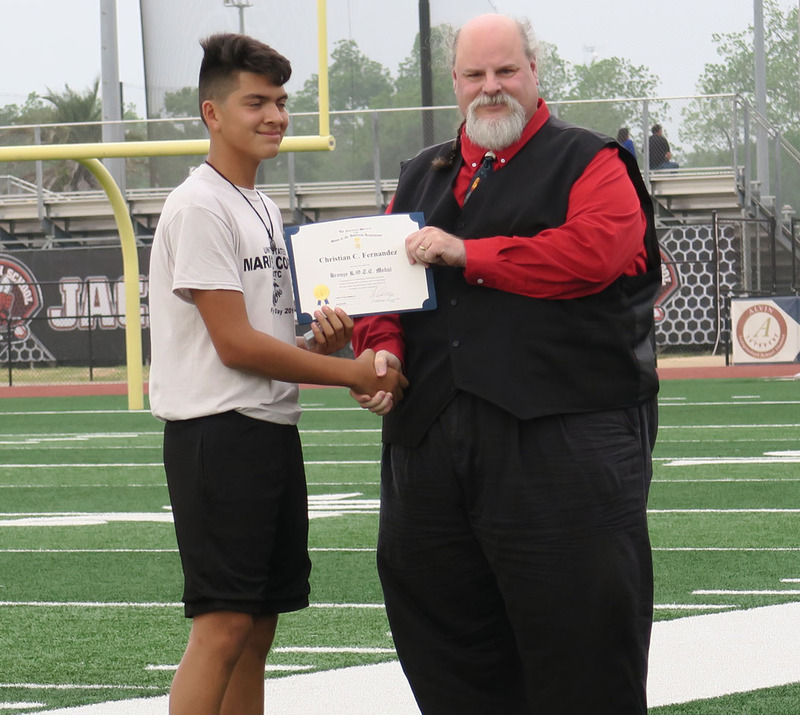 The Outstanding JROTC/ROTC Cadet Award is presented by a SAR Chapter, State Society, or the National Society to ROTC or JROTC cadets who are selected for having a high degree of merit with respect to leadership qualities, military bearing, and general excellence. The recipients are selected by the Commanding Officer (CO) of the JROTC or ROTC unit. One recognition medal is awarded to the cadet (or midshipman) selected by the CO for every 500 members of a unit. A recognition medal can also be awarded in units with less than 500 members. The silver ROTC medal is presented only to recipients chosen from college or university units. 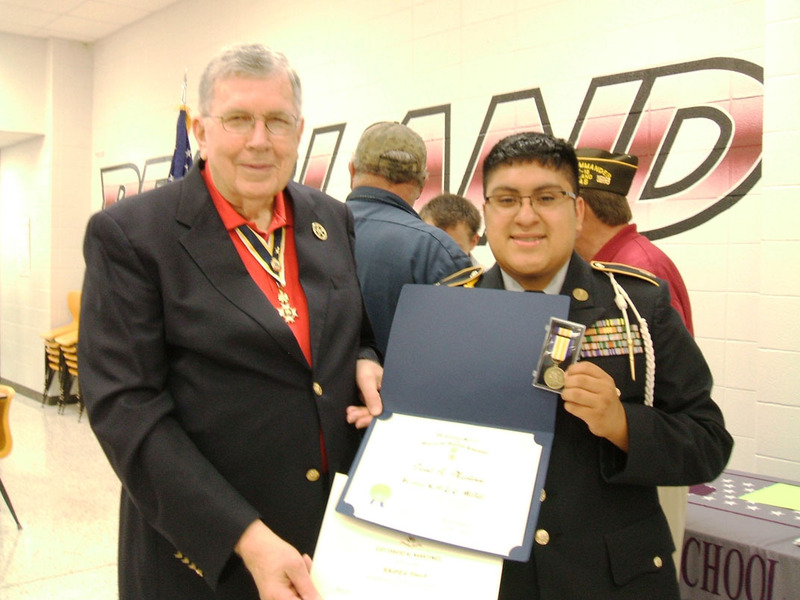 The bronze JROTC medal is awarded only to recipients chosen from high school units. Outstanding students in the Navy Sea Cadet Corps (NSCC) receive the SAR Bronze Good Citizenship medal. 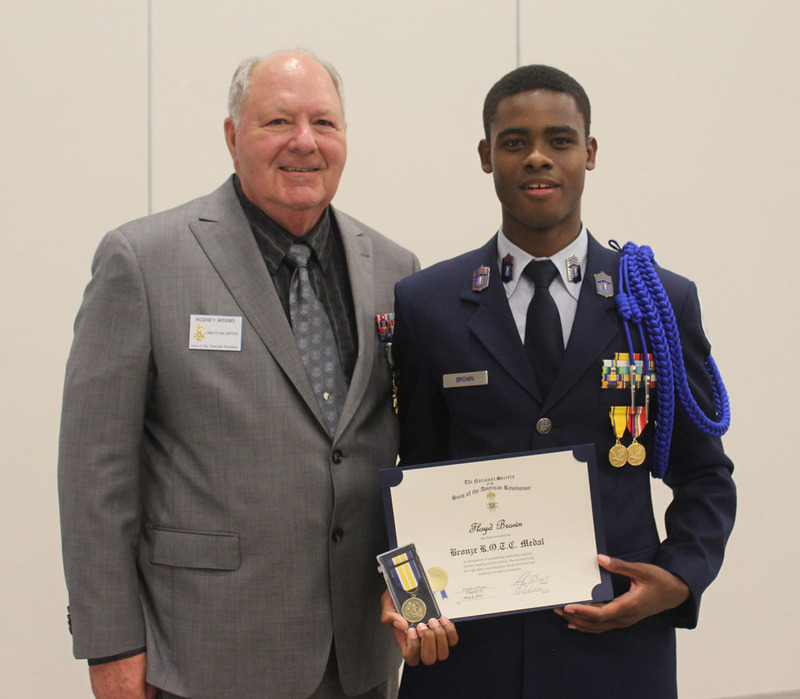 JROTC and ROTC medal awards are initially made at the SAR chapter level. Recipients of the JROTC awards at the SAR chapter level are entered in competition at the state Society level. 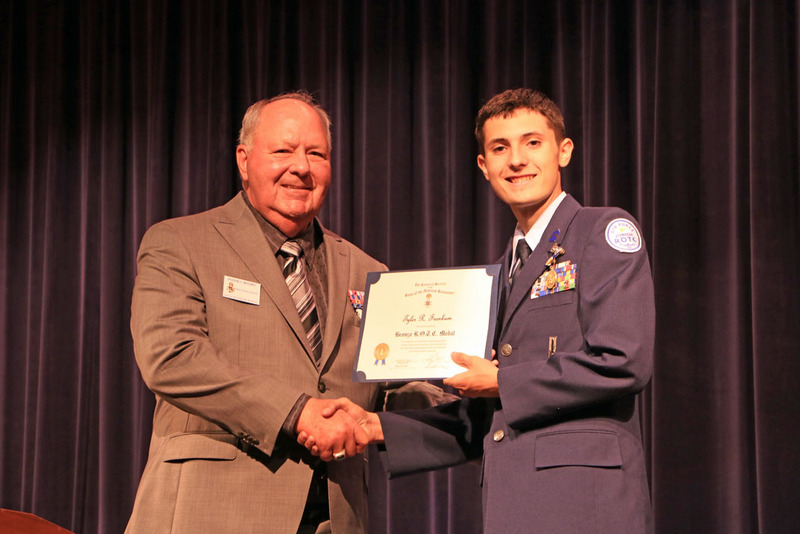 Winners at the state Society level are flown to the annual SAR Congress and compete at the National SAR level. 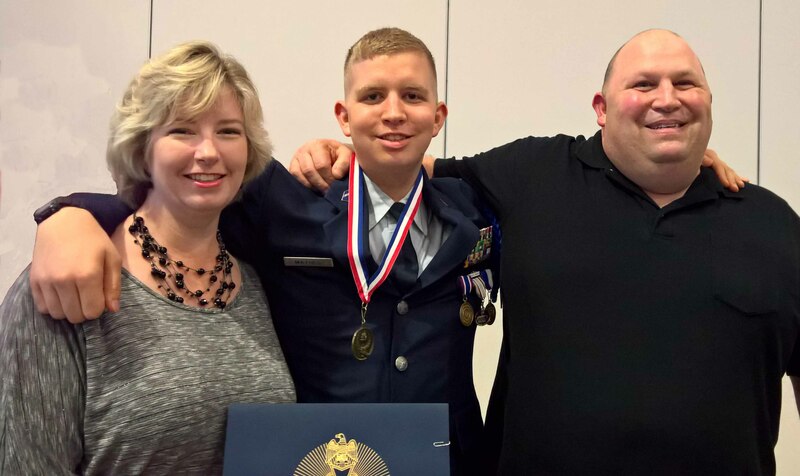 The winner of this competition receives the National JROTC Medallion and $2,000 in cash. The NSSAR invites all American history teachers, whose approved curriculum teaches students about the Revolutionary War era from 1750 to 1800, to apply for the Dr. Tom & Betty Lawrence American History Teacher Award. The award is open to all teachers at the middle or high school levels at a recognized public, private, or parochial institution. While the preliminary rounds of the award program begin at the local level, teachers may eventually advance to the state or national levels, eventually held in June during the annual SAR Congress. These seminars are all valued at $1,400 including tuition, room and board, and transportation. The winning teacher will then bring back to their classroom and students a heightened level of creativity and enthusiasm for the American Revolutionary era.